With far sharper styling, some fantastic equipment on offer and a punchy 200PS 2.2-litre diesel engine, the latest Hyundai Santa Fe punches its way upmarket on merit. Customers choose between five and seven seats, manual or auto transmissions and get standard four-wheel drive. It’s hard not to be impressed. The latest Santa Fe is undoubtedly a good looking thing. It has that inherent rightness to its proportioning that’ll make it tricky not to throw a glance over your shoulder when you lock it and walk away. Road presence is enhanced by smarter front and rear bumpers, with redesigned foglamps and LED daytime running lights, framed with smart silver trim. At the front, a different layout for the xenon projector headlamps has been applied, while the rear lamps feature a fresh LED graphic. Inside, the Santa Fe remains a refined and comfortable place to be, with updates to the console cluster and audio visual navigation system part of the car’s intended upmarket image. A long, wide, single-frame panoramic sunroof allows high levels of natural light into the cabin. Luggage space is decent – 534 litres with the front five seats upright. Passengers in the second row of sliding seats will benefit from greater legroom. As before, the Santa Fe rides on a specially UK-tuned suspension and there’s self-levelling suspension as standard on seven-seaters. Drivers can choose between normal, sport and comfort steering modes and all models have a responsive 4WD system. It’s front-wheel drive most of the time but when sensors detect slippage, up to 50 per cent of drive can be diverted to the rear wheels. In especially slippery conditions, such as muddy off-roading or driving on snow or ice, four-wheel-drive can be selected with the push of the “lock” button, delivering a 50/50 power split at speeds up to 25mph. The UK gets only the 2.2-litre CRDi desel version, with 200PS and a healthy 440Nm of torque. Customers get to choose between a six-speed manual or auto gearbox, both fitted with an extra tall cruising gear for economy. As before, prices sit in the £31,000 to £38,000 bracket and there’s a premium of around £1200 for the seven seat layout most buyers will want. All variants are well equipped, with even the entry-level version getting 18in alloy wheels, reverse parking sensors, daytime running lights, self-levelling suspension on the seven-seat version, air conditioning, Bluetooth connectivity and a multi-function steering wheel. Change Assist and a Rear-Cross Traffic Alert system reduces the risk of collision with approaching traffic when reversing out of narrow areas with low visibility. 161g/km, while the automatic’s figures are 42.2mpg and 177g/km. Both have a top speed of 126mph and the sprint to 62mph takes nine seconds for the manual and 9.6 for the auto. 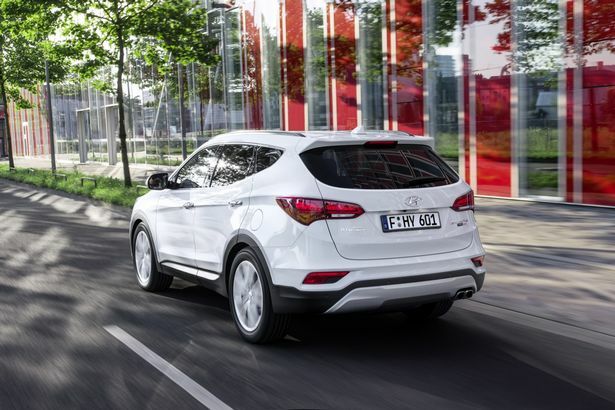 The Hyundai Santa Fe has improved fast, with even slicker styling and better safety tech. All of this makes this Korean contender probably a very good choice for someone who’s never even really considered an SUV before. It’s not showy or offensive and marries all the best bits of models of this kind – space, versatility and ease of ownership. If you’ve got a family and need a car that’ll discreetly go the distance without a hiccup then it’s well worth trying one of these. Do that and, who knows, you might once again start to believe in Santa.